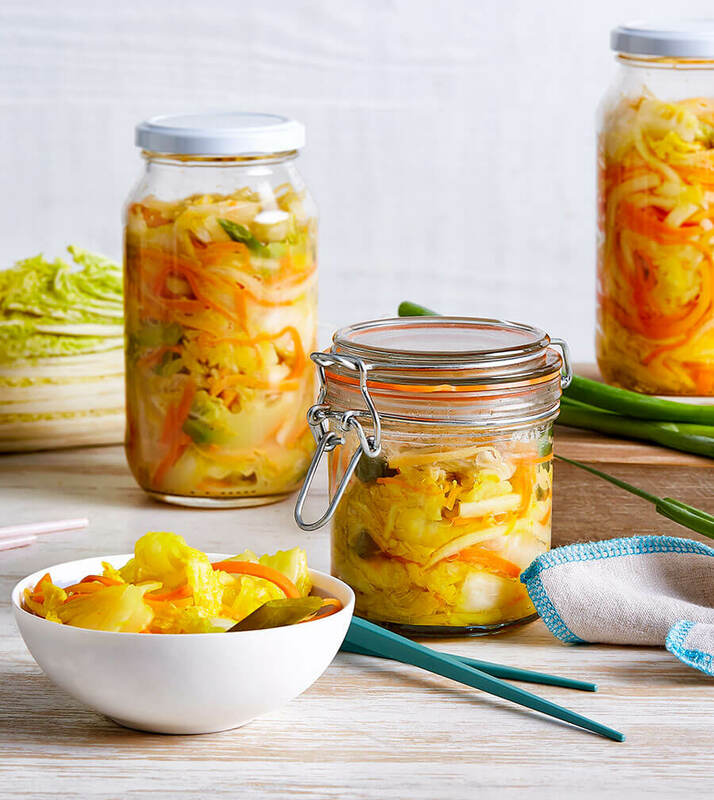 Did you know that kimchi is a great source of probiotics? Great for healthy tummies. Cut cabbage into quarters, core, then cut into thin strips. Place the cabbage in a large bowl with the salt, and using gloves, massage the cabbage with the salt, then add a dash of water. Put a small plate on top of the cabbage, and weigh it down with something heavy (can of beans, glass of water) and let sit for 2-3hrs. Peel and mince the garlic, ginger and turmeric, and combine in a bowl with the sugar (chillies if using) and 3 tbsp water. Mix to form a loose paste, and set aside until needed. Rinse the cabbage 3 times under cold water, and drain in a colander. Gently squeeze remaining water from the cabbage and place in a large bowl. Peel and chop the radish and carrot into matchsticks, slice the spring onion into 3-4cm pieces, and add to the bowl with cabbage. Using your hands (we recommend using gloves for this!) add the paste into the bowl and massage into the vegetables until they are thoroughly coated. Pack the kimchi into the jar, pressing firmly down between each handful until the brine rises to the top of the vegetables. Leave at least 2cm of headspace for the vegetables to expand, and seal the jar. Place the jar on a towel or in a bowl to catch any overflow, and let sit at room temperature for 3-6 days to ferment. Taste your kimchi at different stages, and store in the fridge when its done.